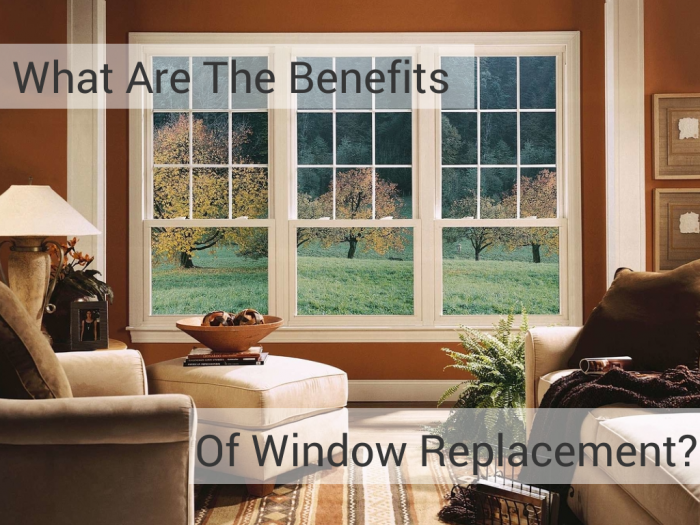 Home » Blog » Window Replacement » What Are The Benefits of Replacing Old Windows? Did you know that replacing old, drafty windows can brighten and update your home while lowering your energy bill by as much as 25%? Replacing your windows also improves the resale value of your home, provides additional home security and lowers the overall maintenance required to keep your windows clean. One of the fundamental benefits of any home renovation project is the financial return homeowners will see on their investment. According to CostHelper.com, replacing old windows will immediately cut your heating and cooling costs and could lower the cost of your energy bills by over 25%. Energy efficient windows that are also currently available can increase the warmth of your home by nearly 50% in some instances. Additionally, in the summer months these new windows can help keep your house cooler. The other financial benefit of replacing your old windows is your return on investment, which can range as high as 90% in most cases. Many reports indicate replacement windows rank as one of the top five returns on investment out of all home improvement projects. Replacing your old windows also offers added home security. Many new windows are specifically tested for forced entry and come with locks for improved safety. New windows will give your house added security, with better locks and more durable materials. Replacing your old windows with new and updated windows will significantly impact both the interior and the exterior of your home. New windows will bring in more sunshine and make your home brighter and more cheerful. New windows will improve the curb appeal of your home and could possibly even add more value when it comes time to sell your home. New windows are designed to be low-maintenance, which means you will not have to spend more on materials such as paint, which is usually the most expensive part of window maintenance (If you go with vinyl windows, you won’t need paint at all). It also means that you will not need to spend money on costly repairs over the years. The hardware for new windows is made from either stainless steel or die-cast zinc that has gone through thousands of tests to ensure that it will hold up. New windows are also very easy to clean as most window manufactures design windows with parts that are easy to remove and reinstall so that they can be thoroughly cleaned. Additionally, some window manufacturers offer lifetime warranties for their products that cover both materials and labor if something goes wrong. One often-overlooked benefit of replacing your old windows is that new windows greatly reduce the transmission of sound that enters your home. New windows also reduce the amount of noise that comes out of your home. This means that you will no longer hear the busy street noises coming from outside and you can play your music as loud as you want without worrying about the neighbors complaining. Another great incentive is that there are several tax breaks for replacing your windows with energy efficient replacement windows. This can reduce the net cost of purchasing and replacing your windows. If you’re concerned about “going-green” or reducing your carbon footprint, this final benefit of replacing your windows will matter a lot. Many homeowners are unaware of the fact that old windows can be very energy-inefficient and contribute to increased energy bills. The reason for that is because old windows are terrible insulators and could cause your HVAC unit to work much harder than it needs to. All of that can cause a higher monthly energy bill than you should be paying. These benefits are just a few of the many reasons why window replacement can be very valuable. If you are interested in replacing your home windows and upgrading to more efficient, lower-maintenance windows, consider Energy Star windows to help reduce energy usage and lower your monthly energy bill. If you have a question we would love to hear from you, fill out our “Consultation” form or call our 24 Hour Call Center at 877-367-1054. One Response to What Are The Benefits of Replacing Old Windows?